Hardwood flooring has become of the most popular residential flooring options in the past 15 years, mainly due to it’s durability and that it can be cleaned easily and quickly. It can also add considerable value as well as beauty to a home. However, if it’s not properly taken care of, in several years you will either need to have it refinished or even replaced, both at a significant cost. Taking proper care of your hardwood floors is even more important when you have expensive flooring such as maple, mahogany and cherry. While there are many popular hardwood cleaning options and products on the market, in most cases a quality broom made for hardwood floors is the best option for daily floor sweeping & cleaning. While they don’t deep clean hardwood, they are gentle on the finish and will sweep away most of the dirt, dust and other solid materials left behind from normal foot traffic. Below is a list of the top hardwood brooms recommended by us and cleaning professionals nationwide. This 18″ professional microfiber broom/mop is perfect for hardwood and solid flooring. It features a stainless steel handle that adjusts from 4 to 6 feet and it’s attached to the aluminum frame with a swivel that rotates 360 degrees so you can make smooth turns in any direction. The 18″ microfiber pad cleans better than regular brooms and even Swiffer pads, plus it’s twice the size, so you get done cleaning much quicker. From dust and dirt to pet hair, this broom is what the professionals use to get perfectly clean hardwood floors. You also get 2 free machine washable microfiber pads with each mop purchase. This rubber bristle broom from LandHope is a great option for cleaning hardwood, laminate, tile and low carpeting. The rubber bristles are perfect for grabbing fine dust particles as well as pet hair and other larger debris. The bristles won’t harm your solid surfaces and it can easily be cleaned after use by running it under the faucet. The adjustable handle expands from 31.5 inches to 55 inches and is 50% more efficient at cleaning than a normal broom. Definitely put this broom on your list. This broom is one of our favorites for hardwood. It’s inexpensive yet features an adjustable handle and soft bristles that are extremely gentle on your floors. Excellent for getting all of those fine particles. This broom also has retractable rubber bristles for catching pet hair. This broom is great for hard surfaces and low pile carpet/rugs. This soft cotton dust mop is a hardwood broom on steroids. This is the same type of broom you see used on wooden basketball floors, gyms etc, but scaled down for residential use. If you have large, open hardwood floor areas in your family & living spaces, this is the soft dust broom you will want to make quick work of nearly all debris. 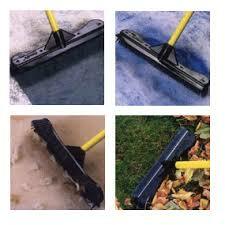 The 24″ cotton mop head is removable for cleaning and the handle is telescoping from 42″ to 72″. Priced around $40, this is a great cleaning investment. The Evriholder is one of the rubber bristled brooms we spoke about in the article above. It’s a unique broom with 100% natural rubber bristles which do an amazing job at trapping even the finest dirt and dust. It will easily sweep up dust, hair, dirt & lint from hard surfaces and is perfect for hardwood. This is a Top Seller on Amazon.com and is priced around $16.00. Definitely consider getting one of these if you have large hardwood areas in your home. Even though a hardwood floor broom isn’t going to damage your floor finish, picking the right one is essential, as not just any old broom will do the job. The finish you have on your floors will determine which broom is best suited to clean it carefully and thoroughly. However, a general rule of thumb is to always select a hardwood broom with the softest bristle possible. This will ensure that you don’t scratch or damage the finish. Soft-bristled brooms, usually made from nylon are what homeowners tend to use on hardwood surfaces. It’s well known that grime, sand and dirt are just a few of the enemies of hardwood floors. To avoid excessive wear damage to your wood or its finish, it is always recommended that you sweep your floor every day. This is the best time to use soft-bristled brooms. Keep in mind that brooms with stiff bristles may scratch the surface of your floor. You should also use a different broom for your kitchen and outside areas, so you can prevent spreading of cooking debris or food spills throughout your house. On the other hand, dry dust mop serves as the best alternative for sweeping. Products like the Swiffer Sweeper have static charged dry mop cloths that attract dust and debris. These are a great way to get the particles that a soft bristled hardwood broom just can’t manage to sweep up. You can also opt in using rubber brooms. This is kind of which have short rubber bristles. They are great for hardwood since the have soft but durable head. They will never mar or scratch your floors. You may also want to consider buying a hardwood flooring vacuum, which can tackle slightly larger messes with ease. Although most people never consider this broom for hardwood, this is much better than the traditional broom. Its pliable rubber bristles form a barrier, so if it is being pulled all along the floor, all of the dust and dirt and even hair are being removed. This is because the bristles are also static charged, like the Swiffer, keeping all debris on the broom itself, and not spreading it as the broom is pushed and pulled. Rubber brooms are considered one of the best brooms for hardwood floors by cleaning professionals and will greatly extend the life of laminate or true hardwood flooring. Through proper use of soft brooms for hardwoods, you keep your floors looking great and lasting for decades. For daily cleaning there’s no need to apply expensive and harsh chemicals. Over time, chemicals will harm your floors finish and potentially the health of your family. Instead, make use of the conventional brooms and sweep away germs, dirt, bacteria and dust.